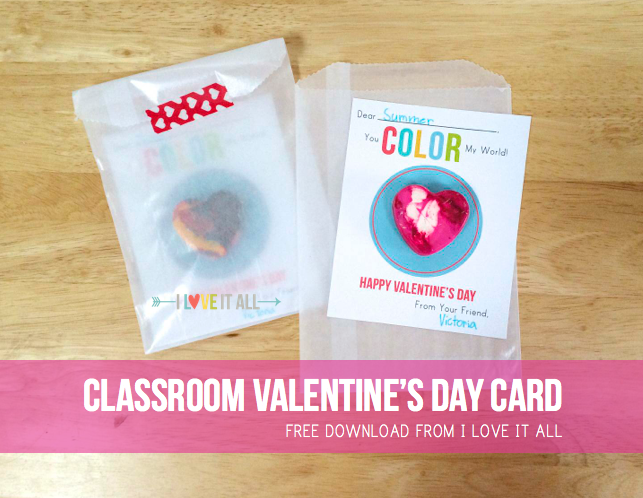 With the idea of making Valentine's Day cards for the girls' classroom friends, back in January I had the them scouring every drawer and art box they had. Our My goal was to rid ourselves of outcast crayons and make them useful again. Surely we're not the only ones to have crayons that are beyond hope and less than loved. Begin by peeling the wrappers off the crayons. This takes some time. + Once peeled, break the crayons into 1/2" to 1" pieces. 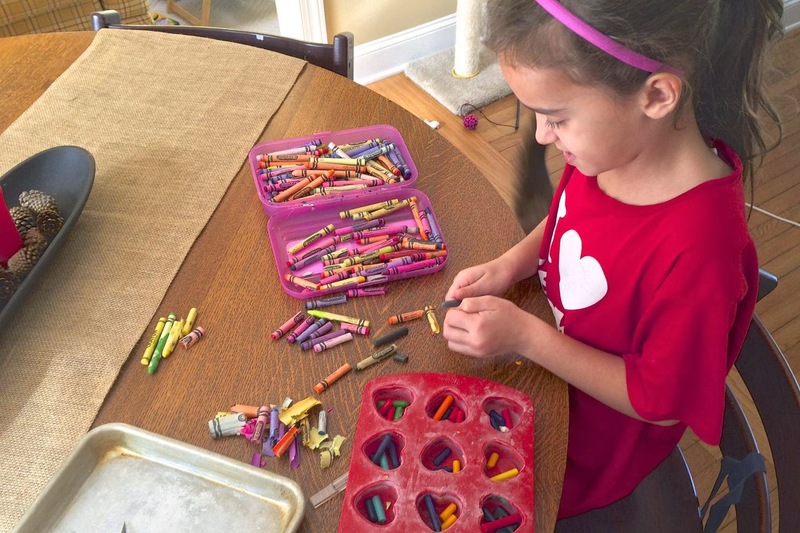 + You can choose to make a single color crayon, but my girls love to combine colors. + Place your baking tray onto a cookie sheet and heat in a 200 degree F oven for 20 minutes, or until melted. + Remove from oven and let cool completely before removing from your baking tray. + After printing and trimming your download to size, adhere the crayon hearts with two foam dots and place inside a glassine bag, this is the one I used, and close with your favorite washi tape. Because we did this project for Isabella's Kindergarten class, I knew that peeling crayon wrappers was a real %$@*!, I would advise that you use your craft knife and slice a line down the middle of the crayon. Obviously, only an adult needs to do this and if your kids are very young, I would suggest that you even do this part when they're not around. Craft knives are dangerous. Because I sliced the crayon wrappers, the time spent peeling was considerably less. And, there was considerably less whining as well. From Mommy and kiddos. 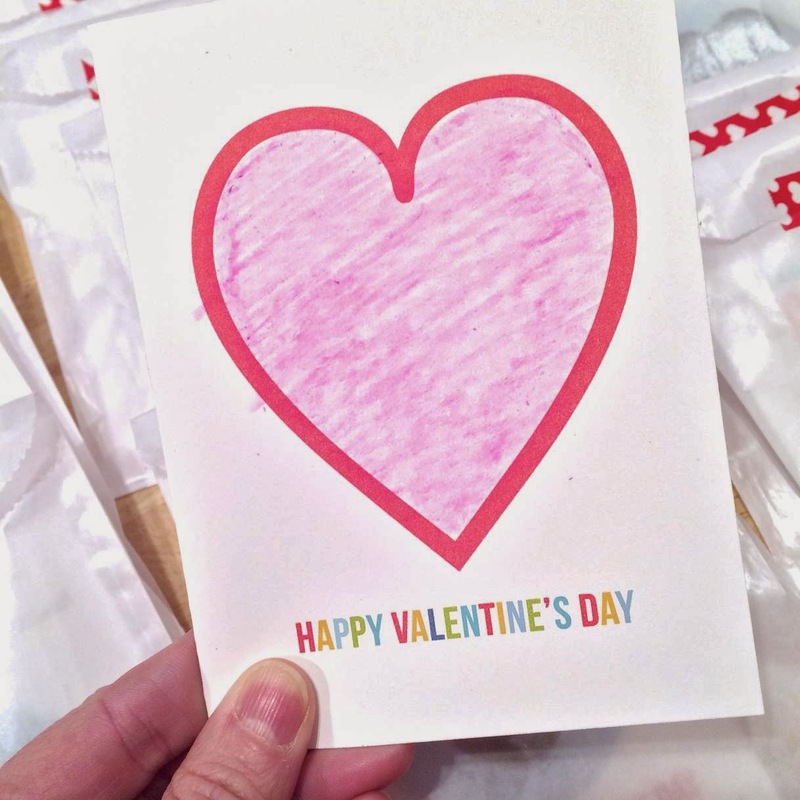 I designed the heart card thinking that the Teachers might allow the kids to color in the hearts with their new crayons and take home a card to their sweet Mom, Dad, Grandma or some other special person they love with all their heart! Oooh, I love all the creative ways you came up with...especially adding crayons to the card with washi. I may try that one next year. At this point, I'm asking the girls not to jiggle the cards around too much as I'm not sure exactly how strong the foam dots will be. I tried glue dots as well and those were no help at all.